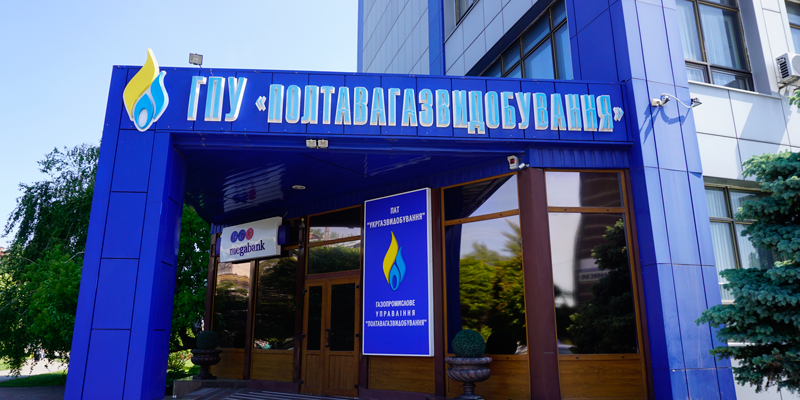 PoltavaGasVydobuvannya Gas Production Division (GPD) is one of the leading enterprises incorporated into JSC UkrGasVydobuvannya. The extraction share of the Division in the total production of JSC UkrGasVydobuvannya for 2017 is almost 39% of natural gas and more than 70% of liquid hydrocarbon. – liquid hydrocarbon: 325,8 thousand tons. The company also produces liquefied gas (more than 30 thousand tons at the end of 2017), mixture of light hydrocarbons (more than 49 thousand tons in 2017) and stable gas condensate (more than 4 thousand tons in 2017). PoltavaGasVydobuvannya GPD is developing 42 hydrocarbon deposits in the eastern and central parts of Ukraine (Poltava, Kharkiv, Sumy and Dnipropetrovsk regions). The performance stock of the Division amounts to 712 wells. The Gas Production Division has 64 production facilities (preliminary gas treatment unit, oil and natural gas preliminary preparation unit, complex gas treatment unit, oil and natural gas complex preparation unit, oil complex preparation unit, cycling process unit, boosting compressor station, gas distribution station and stock of combustible and lubrication materials). The total length of interfield pipelines and flowlines is 3 939 thousand km. For the entire period of its operation, the Division has produced more than 325 billion m3 of natural gas.